This entry was posted in Inspirational by PattyRan. Bookmark the permalink. Hi, I was born in 1982. My grandfather used to say this all the time to me as a kid, “do you think the rain will hurt the rhubarb.” He passed away when I was about 8 years old. I never quite understood what the phrase meant, but it is one vivid memory I have of him. I was just thinking about this today, and of course, my curiosity lead me to Google. Maybe he was trying to give me this lesson as a kid. He was an entrepreneur, an Italian immigrant who won a purple heart at the Battle of the Bulge, and just always had a very positive outlook on life, no matter what was thrown his way. Thank you for the explanation and write up. 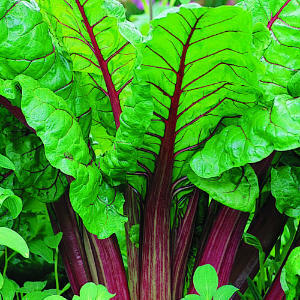 The picture isn’t rhubarb, it’s Swiss Chard. Good story but we’re gardeners, amirite? Haha, I’ve never heard that either! Nice memory! Thanks for posting this. My father and uncle would say this and laugh. I always thought it was an inside joke and I’ve wondered about it for 50 years. Didn’t know it was an old idiom.